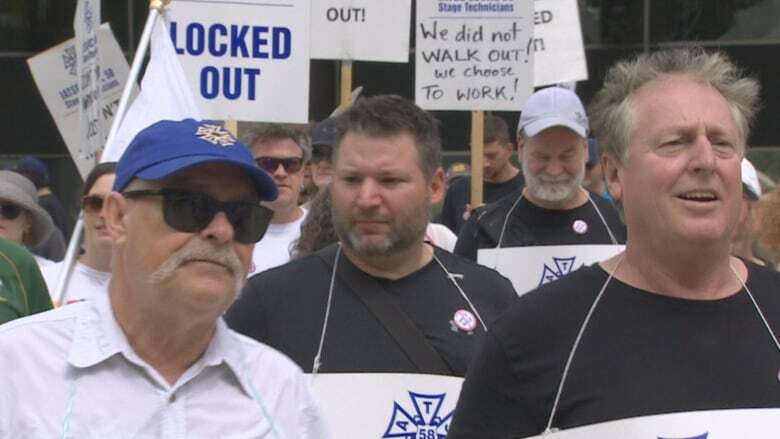 More than 200 unionized stagehands locked out of Exhibition Place rallied at Toronto city hall on Monday to put pressure on the city to negotiate. The members of International Alliance of Theatrical Stage Employees (IATSE), Local 58, marched in a circle for two hours, with many carrying placards, some waving flags and a few walking dogs. Members of Canadian Union of Public Employees, Elementary Teachers' Federation of Ontario, Ontario Public Service Employees Union and the United Steelworkers of America joined the IATSE members at the event. Justin Antheunis, president of IATSE Local 58, says the union is ready to negotiate and wants Exhibition Place, which is owned by the city, to return to bargaining talks. The board of governors of the entertainment and convention site locked out the workers in mid-July and rejected a proposal for binding arbitration on the weekend. "We are willing to meet 24 hours a day," Antheunis told reporters at city hall. The rally comes five days before the Canadian National Exhibition, which takes place at Exhibition Place, is slated to open. The annual fair will be behind a picket line on Friday if there is no return to the bargaining table. The union provides technical and staging expertise for venues at Exhibition Place. Antheunis said Exhibition Place has brought in replacement workers from Quebec to set up the fair. He said on Friday there will most likely to be a picket line at the CNE, with union members handing out information to fair-goers. "The CNE is near and dear to the hearts of many people in the city of Toronto. And it saddens the members of Local 58 that we can't do the work we love doing every day." At issue is contracting out. The workers are upset with a plan by Exhibition Place bring in its own workers to set up and supervise events, while they still don't have have a contract. Workers haven't had a contract since December of 2017, he added. Both sides last met in mid-July and the union said it tabled the last proposal before it was locked out. On the weekend, Coun. Justin Di Ciano, vice chair of the board, said the entertainment and convention site locked out the workers because it wants to be more competitive. In a statement released before the rally on Monday, Mayor John Tory said bargaining talks between the union and Exhibition Place is "under the purview" of the Exhibition Place board of governors. "We understand that Exhibition Place remains willing to return to the table, whenever IATSE Local 58 is ready to provide a meaningful response to the proposals which are necessary to move Exhibition Place forward within a very competitive marketplace," Tory said in the statement. "We also understand that Exhibition Place offered to avoid a lockout or strike during the CNE and that the union rejected any such proposal." 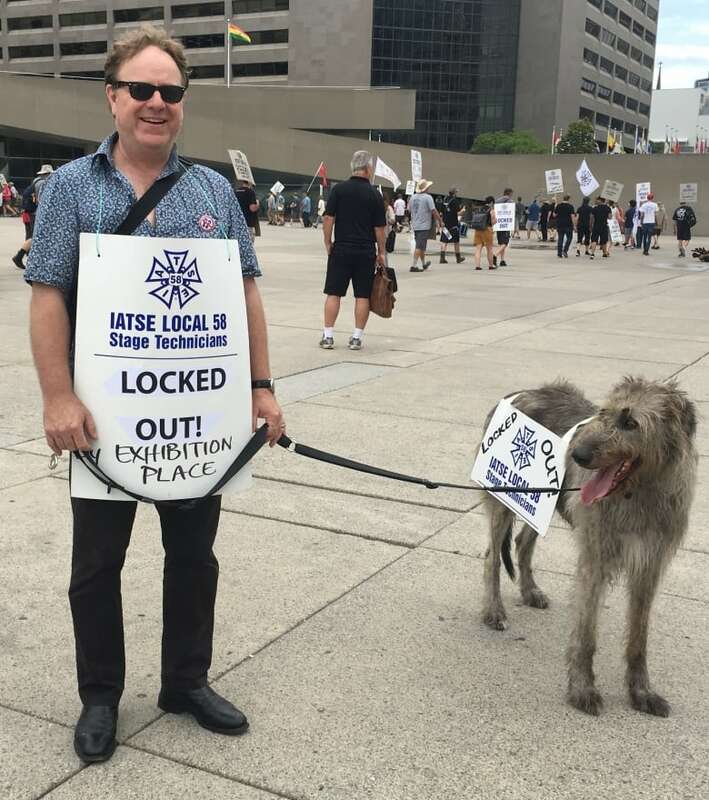 Meanwhile at the rally, James Fulton, a touring carpenter with the National Ballet of Canada, walked in the humidity with his dog Willow, an eight-year-old Irish wolfhound. "We just want to get back to work," he said. "It's frustrating and it's sad that they won't come back to the table." According to the city, the Exhibition Place board of governors manages and operates the grounds of Exhibition Place but reports directly to city council.